These small pocket diaries of Emma Wedgwood Darwin (1808-1896), the wife of Charles Darwin, are reproduced with the kind permission of their owner Richard Darwin Keynes. 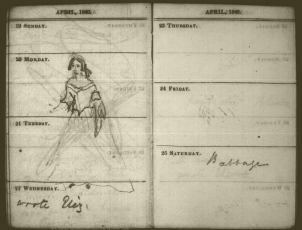 The images are scanned from the microfilms prepared by Cambridge University Library where the diaries are kept. The black and white images, over 3,200 in all, have had a slight yellow tint added. * There are sixty diaries covering the years 1824, 1833-4, 1839-45 and 1848-96. Emma recorded many events such as visits and visitors, dinners and the health of her family including her husband. The books also contain drawings by her children. • See the introduction to Emma's diaries by Janet Browne. 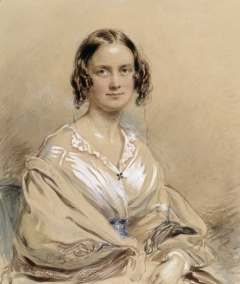 Emma Darwin aged 31 in 1839. Watercolour by George Richmond. Portrait reproduced courtesy of the Darwin Heirlooms Trust. Pages from 1840 and 1860. Litchfield, H. E. ed. 1915. Emma Darwin, A century of family letters, 1792-1896. London: John Murray. Hundreds of other items on Emma Darwin can be found in Darwin's private papers on Darwin Online, here. Compare with [Darwin's 'Journal' (1809-1881)]. * Blank pages, containing no written entries, were not microfilmed.